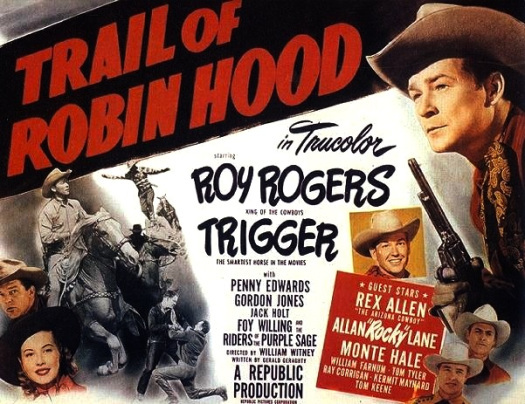 There’s no sign of Robin Hood to be found in the Roy Rogers vehicle TRAIL OF ROBIN HOOD. 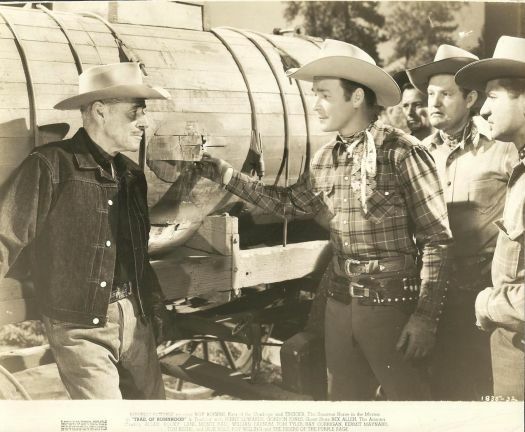 However, the film has gained a cult following among sagebrush aficionados for the plethora of cowboy stars gathered together in this extremely likable little ‘B’ Western directed by Republic Pictures workhorse William Whitney William Whitney, with plenty of songs by Roy and the Riders of the Purple Sage to go along with that trademark Republic fightin’ and a-ridin’ action (thanks, stuntmen Art Dillon, Ken Terrell, and Joe Yrigoyen!). This entry was posted in Film, Film Review and tagged Allan Rocky Lane, Cracked Rear Viewer, Gary Loggins, George Cheseboro, Gordon Jones, Jack Holt, Kermit Maynard, Monte Hale, Penny Edwards, Ray Crash Corrigan, Republic Pictures, Rex Allen, Roy Rogers, Through the Shattered Lens, Tom Keene, Tom Tyler, Trail of Robin Hood, Trigger, western, William Farnum. Bookmark the permalink.